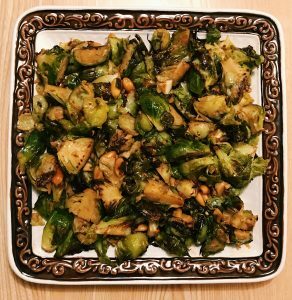 Kaidy’s Post: Kung Pao Brussels Sprouts! Brussels Sprouts are part of the Brassicaceae family along with kale, cauliflower, broccoli and mustard greens. They are also referred to as a cruciferous vegetable. This vegetable resembles mini cabbages and are usually loved or hated for their bitter taste. 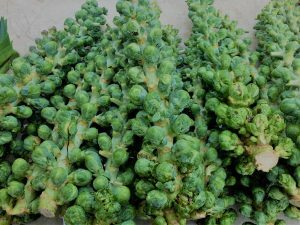 Brussel sprouts are in season in the seacoast area from the beginning of October through the end of December. Brussel sprouts contain 28 calories and 2 grams of fiber per half cup serving. They also contain 137% vitamin K, 81% vitamin C, 12% vitamin A, 12% folate and 9% manganese of the daily recommended values. Brussel sprouts are also extremely high in antioxidants, especially the antioxidant kaemperfol, which has been shown to reduce cancer cell growth, ease inflammation and be beneficial for heart health. They are also high in fiber which promotes a healthy digestive track and regularity. There are many ways to eat brussels sprouts from boiling, sautéing, steaming and my personal favorite: roasting. If you aren’t a fan of these bitter sprouts, roasting caramelizes the outside making their taste not as harsh. Adding seasonings like garlic, salt, olive oil and even a little parmesan cheese can also neutralize the taste of this cruciferous vegetable. Below is one of my favorite recipes for roasted brussels sprouts! Toss Brussels sprouts with olive oil and place in a single layer on a baking sheet. Roast until tender and slightly crisp, about 25 minutes. While the sprouts are cooking, whisk together the scallions, soy sauce, rice wine vinegar, sugar, water and corn starch in a small bowl. Right before the sprouts are done cooking, heat a wok (or fry pan) over medium-high heat. Add in the chilis, ½ teaspoon red pepper and black pepper and cook until slightly toasted, stirring often. Add in the peanuts and cook another minute until toasted. Reduce heat to medium and add in the garlic and ginger and cook another minute. Add in the corn starch mixture. Cook for 4 to 5 minutes until thickened, stirring occasionally. Add in the cooked Brussels sprouts and toss until hot and coated with the sauce.